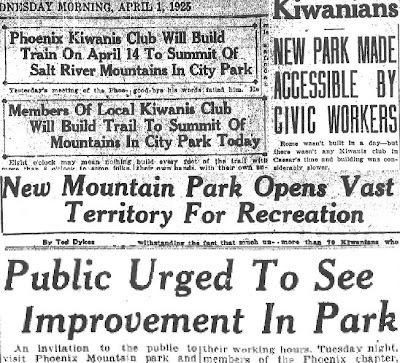 Phoenix will have a public mountain park if the plans launched by the city planning commission and approved by the city commission Friday afternoon are carried out. 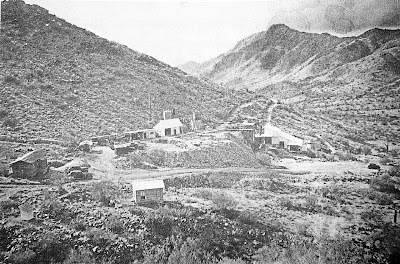 More than 14,000 acres of land, consisting of the Salt River Mountain range south of the city is to be acquired by purchase from the United States government and converted into a pleasure resort for the people of Phoenix, according to announcement yesterday by members of the city planning commission who have been co-operating in this movement. The announcement follows several months of negotiation on the part of the city planning commission and prompt action on the part of the city commission as soon as the proposition was called to its attention. The city commission passed a resolution Friday afternoon requesting the United States government to withdraw the land from entry, and pledging itself to purchase 14,000 acres of land in the Salt River mountains at $1.25 per acre for the purpose of converting it into a public park. A telegram was received at the local land office yesterday from the Secretary of the Interior Work in which the local officials were instructed to withdraw the lands involved from entry until such time as Congress may be able to take action on the question. Senators Ashurst and Cameron and Congressman Hayden have all pledged their support to such a measure, according to J. C. Dobbins, chairman of the city planning commission, and there is little doubt but that the lands will be withdrawn. Prompt action on the part of the city commission, according to Mr. Dobbins eliminated a lot of delay and will make the park a reality in a comparatively short time. The mountains contain many canyons, trails of historic interest, hieroglyphic rocks and the topography is such that a scenic drive can be built from one end of the range to the other. Persons who are familiar with this stretch of country declare that this drive will be one of the most beautiful in Arizona. Just at the southern end of Central avenue in the mountains is a high valley which is admirably adapted to the construction of a 36-hole golf course which may be developed into one of the finest in the country, according to Mr. Dobbins, who says that he and other members of the commission who have been working on the plans have thoroughly familiarized themselves with the topography of the region and know its possibilities. There is a fine spring of water in this valley which when developed will furnish an ample supply of water for the development of the golf course. 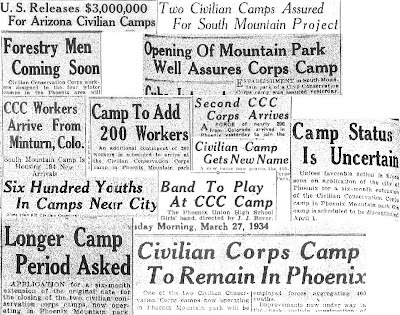 Other development plans are being worked out by the committee in charge consisting of W. G. Hartranft, H. L. Aller, Harry Asbury, Mrs. Louie Gage Dennett and Warren McArthur, who are working with the mountain park committee, consisting of J. C. Dobbins, Mrs. John Hampton and H. B. Wilkinson. The committees have already had maps prepared showing the route of the proposed ridge road, which would extend for almost the full length of the range. Trails leading into the ridge road will be developed, bringing the highest points within easy access to the city of Phoenix. Stables are also to be built in order that persons may be able to motor out from the city and secure mounts for the exploration of the more mountainous districts which are inaccessible by automobile. Members of the committee say an abundance of fresh water may be developed. The entire cost of the project will be approximately $18,000, according to members of the city planning commission, who have made the estimate. In placing their proposition before the city commission the members declared that the entire cost of the project may be absorbed within two years at an increased levy of two cents per $100 valuation. Great article from 1924! An entire trail built in a single day, with Beer and Ice Cream for their reward! Trail advice from C. M. Holbert, the park's original caretaker. So where's the Haunted Cave??? If it could only get this much attention today. This used to be in the park's brochure, now hardly anyone knows about it. It's called Geronimo trail now! Always wanted to know more about this place. Lots of hard work by those 400 boys from Colorado. "Unusual spectacle of snow beds lying on the higher parts of the South mountains" I would love to see that. Sure has changed a bit. Only 1 picnic table on the south side of south mountain...enough to seat 1,000 on the north side. Please send me more! I love old maps. Wow, a 300 foot tunnel under Telegraph pass! And Park Circle Drive which would have gone around the entire park. Nifty stuff on here that's not on the current maps...like Natural Tunnel and Wonder Spot! The trail names sure have changed. Check out how City trail went to the original summit. These are awesome! Rest in Peace, Reg. Feedback is important to me. I have a full time job, and it helps me justify spending more time doing research. Thanks, and I'll see you on the trail! Also remember to click on the years in the Blog Archive in the upper left area of this page to see all the posts for each year! Photo Caption: William Lunsford, the original Mr. Scorpion Gulch, caters to scores of neighborhood children who know him affectionately as "Grandpa." Meet the original Mr. Scorpion Gulch. GRANDPA BILL doesn’t like to see two kids sharing the same bottle of pop. “It isn’t sanitary,” he says. So he remedies the situation by furnishing the second bottle of pop out of his own pocket. Bill owns and operates the small store, curio shop and cactus gardens on South Central near the entrance to South Mountain Park. IN 1936, LUNSFORD purchased the 100 feet of frontage. Her personally hauled the rock and built the store with living quarters attached where he and his wife lived and operated the business. His wife died several years ago and Bill now lives alone. He doesn’t make much money, what with giving away bottles of pop, and he is one of the few remaining merchants who sells penny candy. He probably gives way more than he sells. He just can’t resist giving away candy and pop to his “grandchildren” who lack the necessary money. BILL ISN’T too well, so some of the children, at their own expense, rigged up an alarm from Bill’s place to a home so he can summon aid in case he needs it. LUNDSFORD HAS a large stock of curios and Indian made items in his shop but because of his infirmities he is just selling out what he has on hand and not replenishing his stock. 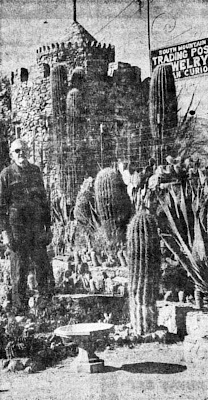 In the adjacent cactus garden Bill has more than 1,800 species of cacti, imported from many countries. Other business concerns in the vicinity use the name, “Scorpion Gulch,” and that’s all right with Lunsford. TO THE MANY children who visit him daily he’d rather be known as “Grandpa.” He believes a bottle of pop from “Grandpa” tastes better than one from Scorpion Gulch.